We’re starting off our week by finding a creative way to make use of our copious supply of local apples! Appalachia is known for its abundance of tasty apples in the fall. We have been so grateful to cook with apples from nearby orchards, which taste so fresh and so sweet! As we gear up for Thanksgiving, our kitchen is full of autumnal spices. These apple pie bars are flavored with cinnamon, one of our favorite spices. It has antioxidant and anti-inflammatory benefits, can improve your body’s sensitivity to insulin, and more. 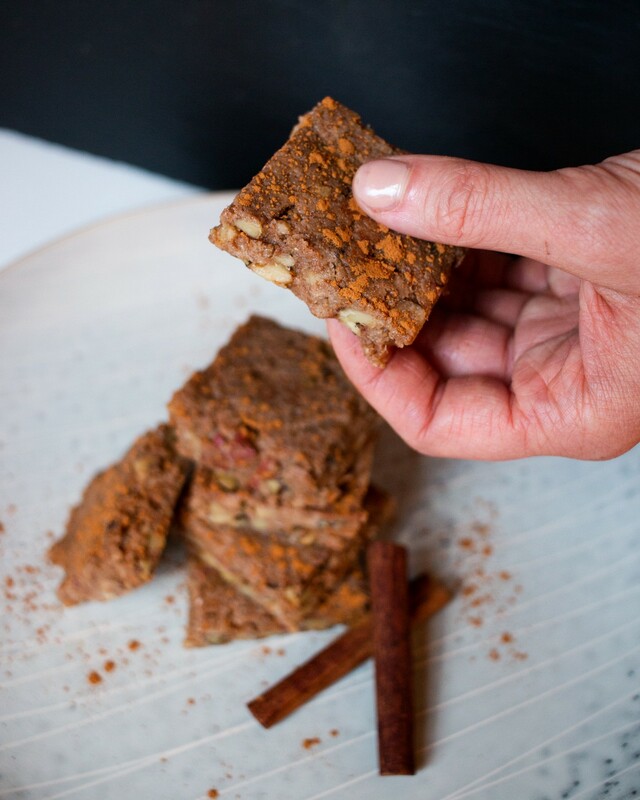 Combined with the possible benefits of CBD, these bars are a yummy dessert and a great way to support your body as we transition into winter! Drain dates until all water is removed. Blend all ingredients in a food processor. Press into lined baking pan and freeze until solid. Remove from freezer, and slice into rectangles. Store in the freezer/refrigerator.